Day 4, start of our first day in Maesai, the small little town at the top of Thailand. 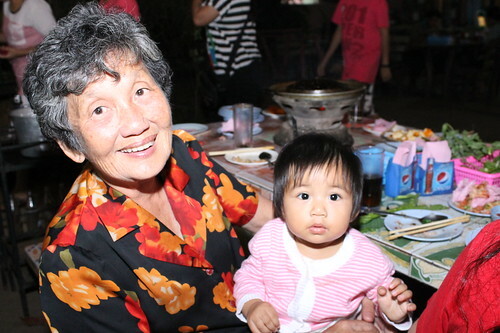 By now, we’re used to Thailand time, meaning that our we were starting to wake up at a more respectable hour. Usually about 8am local time. 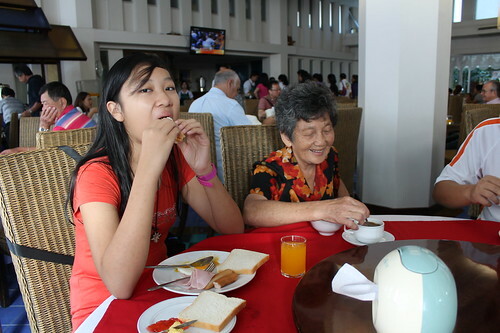 Piyaporn Place Hotel is a pretty nice hotel, nothing fancy, but they have good breakfast (although the seating area is quite small). 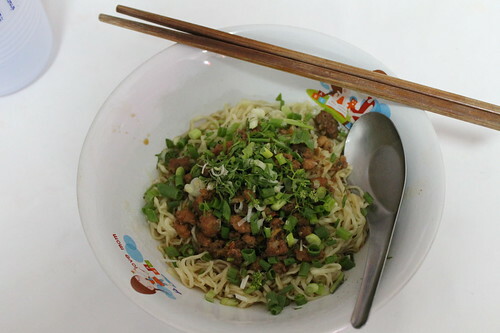 Breakfast is usually fried rice or fried noodles, plus the staple sausages and sunny side up eggs. While Maesai is still quite high in terms of altitude (although not as high as Mae Salong), be warned that weather here can be burning hot even in early winter. Even at 9am during breakfast we can feel the heat from the sun outside. 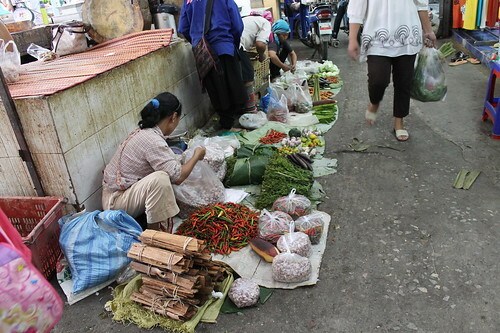 First order of the day, we take a short walk from the hotel to the market two blocks down. 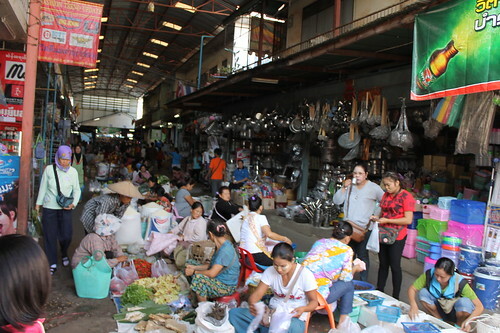 The market is sprawls in different direction, taking up the backlanes of the shops and ends in many different exits. 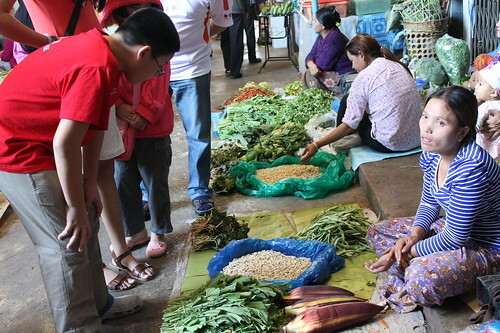 Most of the vendors are hilltribe folks, Myanmar immigrants and locals. The white stuff Jeremy is looking at are bamboo worms. Apparently, it is quite a delicacy around here. Suffice to say, I decided to pass on that. Anyone can setup a stall anywhere. 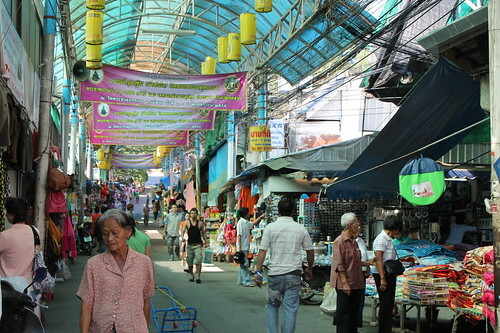 But around the fringes you can also find clothes, shoes, trinkets, the usual Chinatown wares. The was even a stall selling knives and blades and machetes. Too bad they didn’t have a slipstrop or i would have bought one. We exited the market further up north. 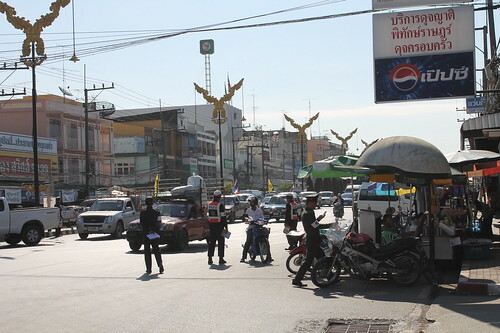 This is the main road in Maesai leading up to the border checkpoint. During the daytime the traffic entering Myanmar can stretch up to half a mile. Today, the traffic cops are doing an impromptu check on the vehicles. 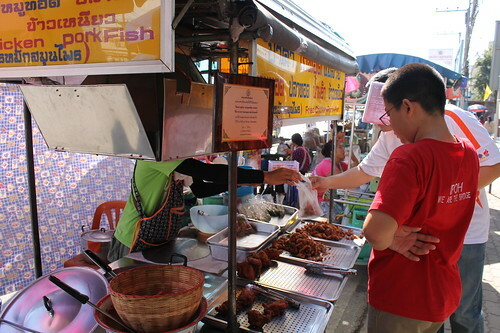 All along the way, the sidewalk is crammed with stalls selling foodstuff and drinks. Fried chicken tastes good anywhere in the world. Somewhere further on to your left, is the entrance to Wat Phra That Wai Dao. In terms of touristy attractions, other than the neverending markets, there really isn’t much to gawk at in Mae Sai, except this temple. 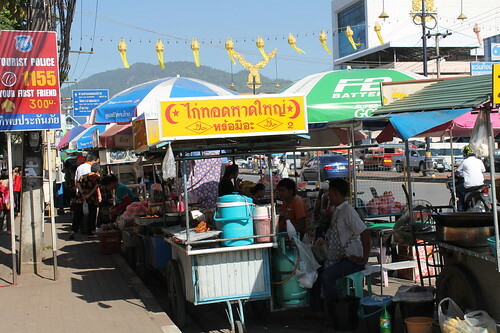 If you walk up the steep road at the end of the market, you will see… more steps. What’s at the top of the stairs? Well, our guide Calvin said, ‘only 100 steps up’. Oh okay, that’s not too bad. That’s like 5 floors up. So me and WY started up the steps. 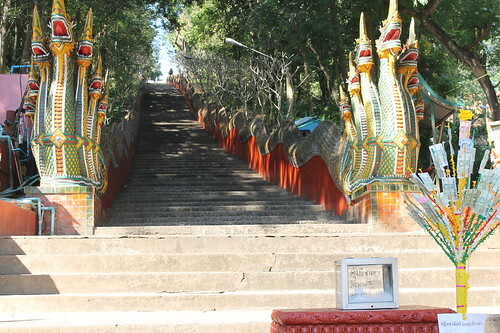 Besides the steps being wide (meaning its harder to climb), it turns out there are 205 STEPS. Yes, I counted every step. 100 steps my foot. So it was akin to climbing up 10 storeys and then back down again. 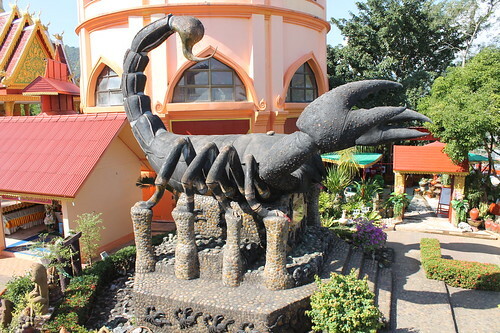 Anyways, at the top, there’s a stupa, a scorpion statue (er, izzit coz ancient Thais are Klaus Meine fans…? 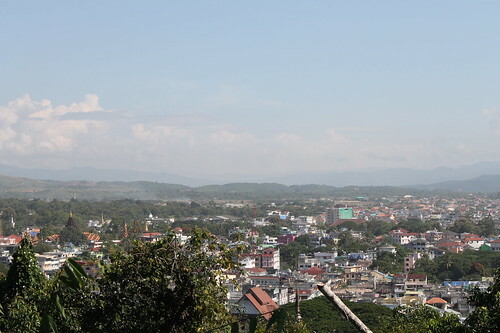 ), and a panoramic view of Myanmar. From this distance, Myanmar looks a lot like Thailand (or Tanjung Sepat, for that matter). But i guess to really experience Myanmar, you need to actually enter the country. Which is actually very easy to do. All you need to do is to pay a small fee, and cross this bridge. Since there was nothing much to see there, we decided not to cross anyway. 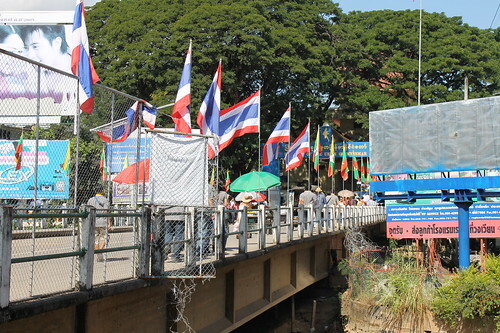 The above pic was taken from the road below the bridge across the border. 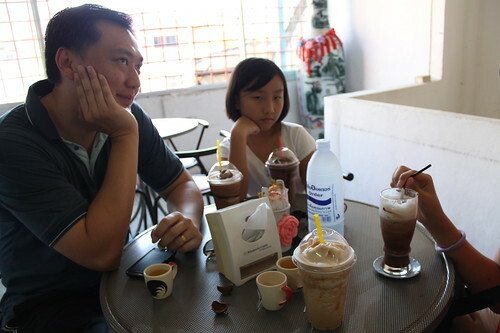 Instead, we turned back towards town and had some ice-cold coffee instead. Walking in the burning hot weather is tiring. A little further on from there, we stopped for lunch. 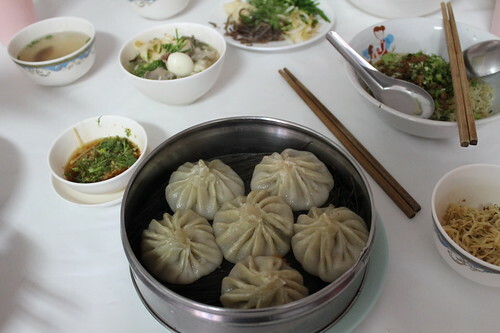 Along the side roads of Maesai, there’s a small Yunnanese restaurant serving Shanghai Pao and noodles. It’s a little difficult to find, but it’s the only makan stall with Chinese words. 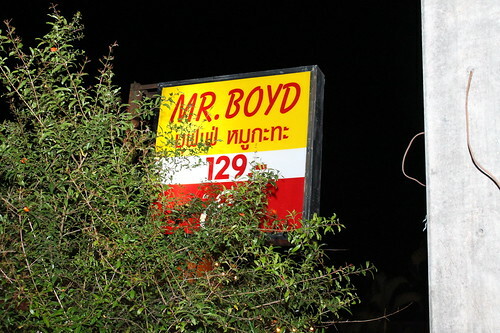 Alas, the name of the shop is in Thai so I’ve no idea what’s it called. 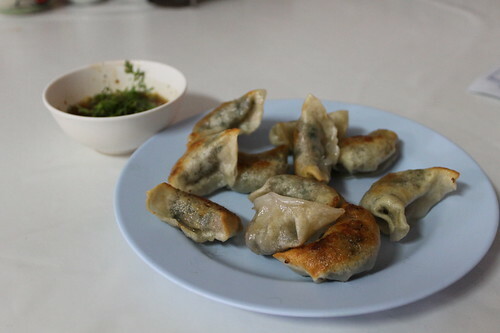 The modest shop serves pretty good food. After lunch we went back to the hotel for a rest (so… tired… so… hot…) In the afternoon, my BIL had to go back to the orphanage to meet up with some contacts, so we went off to Tesco Lotus again. 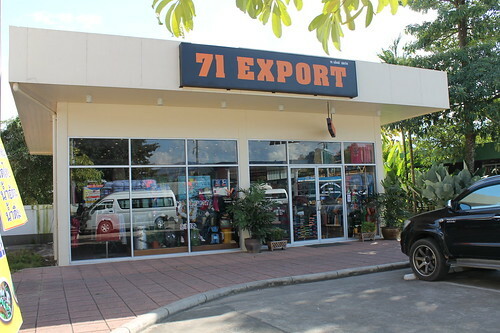 Before that, we dropped by a factory outlet store owned by Calvin’s friend. Not very big, but i bought an Arsenal jersey for RM20. Not original (!). Calvin next to a lot of water. 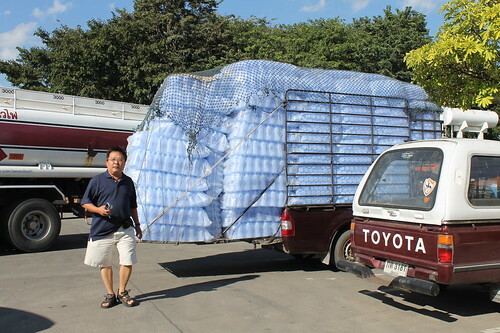 We also sent our clothes to the laundry. 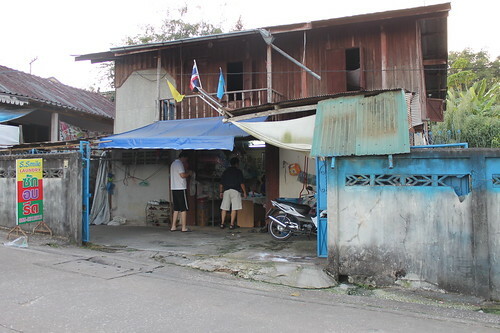 This is how a local laundry looks like. Not impressive, but its cheap and effective. RM18 for two loads, they even iron the clothes for free. 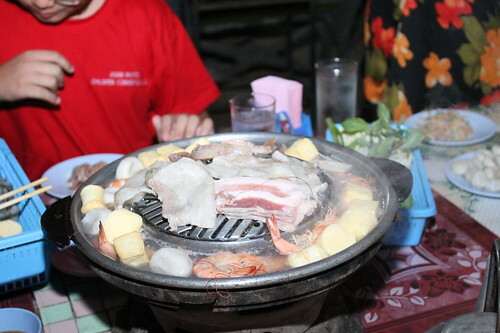 Dinner for day 4 was this BBQ / steamboat place my BIL recommended. 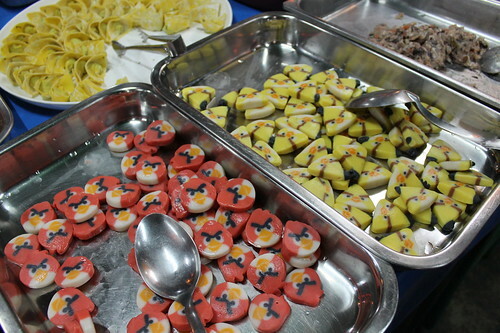 For RM7.90 a head, you get unlimited supply of marinated meat, vegetables, fruits, etc. Plus, this is quality stuff. The downside? To coat the BBQ plate, they give you lard instead of margarine. 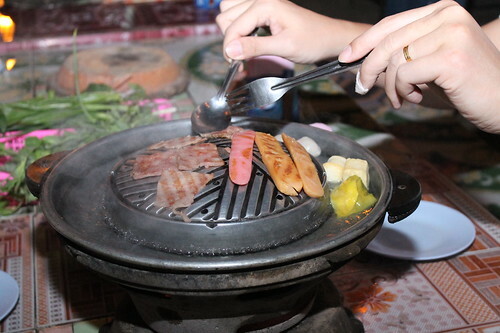 I didn’t use any, so by the end of the meal there were bits of charred meat stuck to the plate. 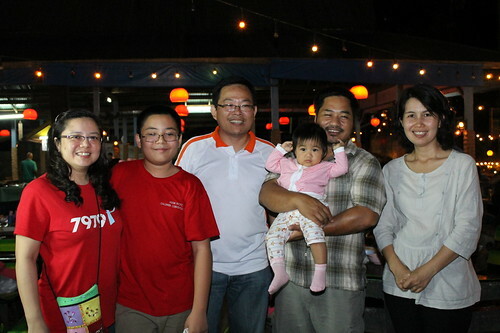 Dinner was together with the missionary who heads the orphanage, plus his family. 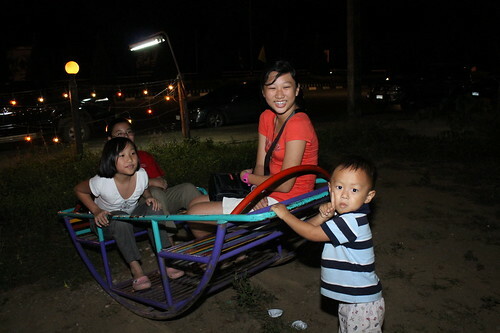 The kids playing with a boy from the restaurant. The boy is so strong he can hold down the see-saw with all three kids on it. Bright future as Mr. Thailand. 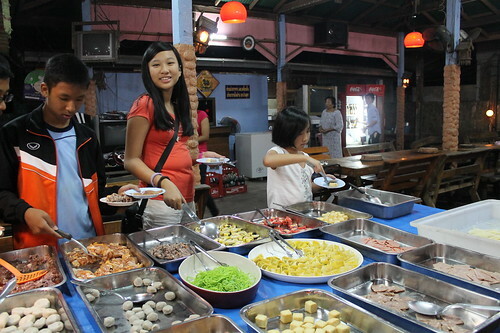 Then after eating half a cow, 4 chickens and a whole non-kosher farm animal, we went back to the night market. 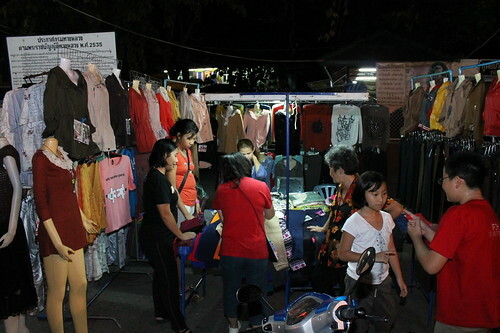 Tonight being a Friday night, there were lots more stalls open. Seen here below, the ladies supporting the local economy. 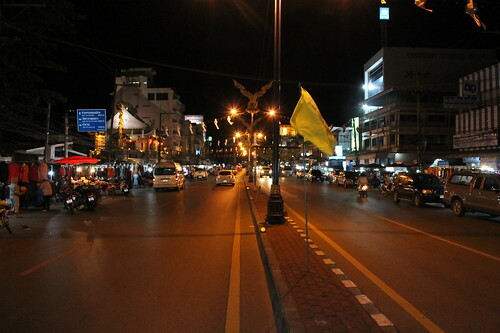 Night of the main road.